The theme integrates well with the WP Instagram Widget plugin. Install this plugin and use the available Instagram widget to set up a feed in any widget area. Instagram in the sidebar: If the Instagram widget is assigned to any sidebar area, then it will show up as a grid (3x3). 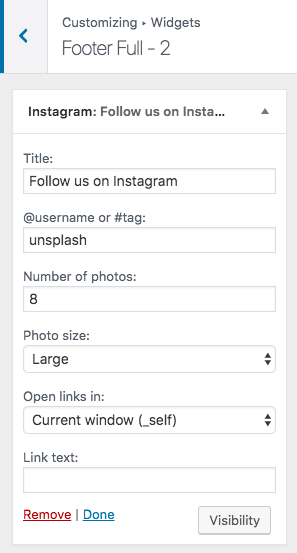 Instagram in the footer: If the widget is assigned to an area on the footer (Footer Full 1 or Footer Full 2), the widget will appear as a multi-column responsive gallery (like a film strip) of Instagram pictures.